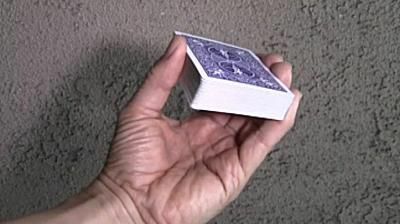 Also known as the Charlier, cut, the one-handed cut allows you to hold a deck in your hand, break it apart into two halves, and exchange the cards' positions. It’s a flashy card move that will augment your card magic tricks. When learning the one-hand cut, separate the deck into two parts and hold the segments together using rubber bands. This allows you to learn the move without having to constantly pick up dropped cards. When you’re confident with the cut, remove the rubber bands and keep practicing. Keep in mind, you don’t have to use the entire deck when you're learning. Instead, use half of a deck—or whatever amount is comfortable—so you can learn the moves and grow accustomed to the clearances and such. To start, hold the deck of cards in your hand. Using your thumb, release the bottom-half of the deck (B) and let it fall into your palm. Meanwhile, hold the upper-half of the deck (A) using your thumb and fingers. Using your middle finger, push the lower-half (B) of the deck up, pivoting it on its long edge against your hand. Continue to push the half of deck (B) with your middle finger until it’s standing on its edge and “clears" the upper-half (A) of the deck. Notice the middle finger pushing the lower-half of the deck (B). Once the lower-half (B) “clears” the upper-half (A), allow the upper-half (A) to simply fall into your palm. At this point, use your thumb to release the original lower-half (B) onto the upper-half (A). The top and bottom halves of the deck have exchanged positions. You’re left with the deck in your hand as you were when you started the one-handed cut.